Life, cabin fever and writer's block are in play right now. Must be February! 😱 I'll be back soon! 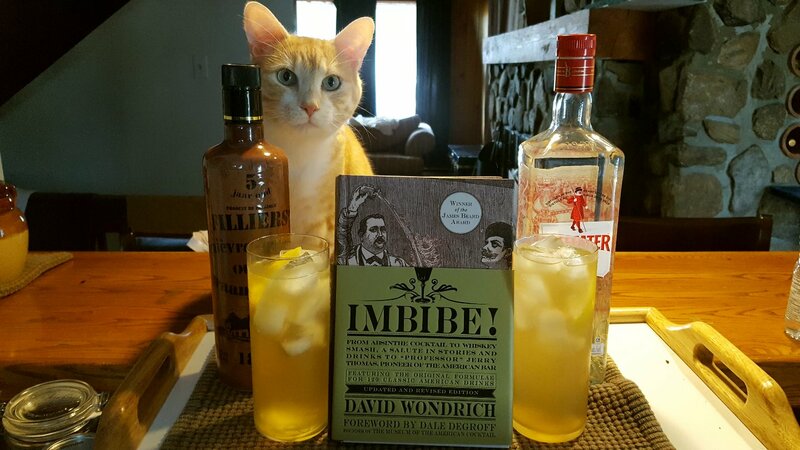 Well, I opened one of the Camemberts last night for Christmas Eve. As you can see it was terribly runny. I did some research and talked to a few buddies on a cheese forum. Meaning: I left it "aging" too long in the cheese cave. 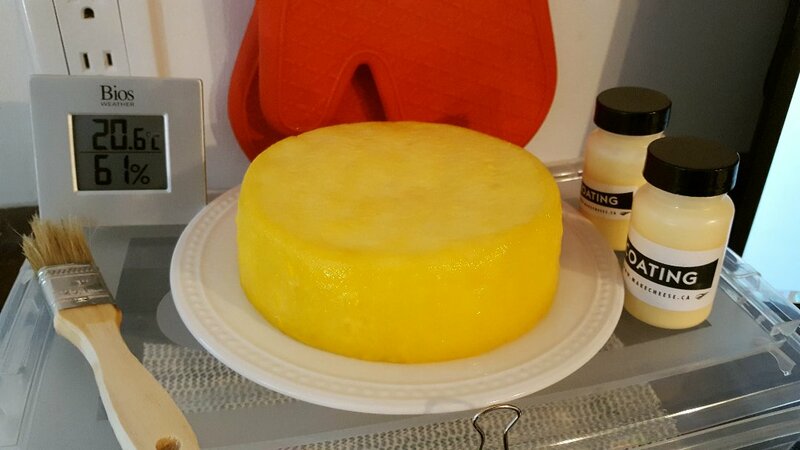 The recipe I used stated that it could be ripened in the cheese cave for 3-5 weeks. I pushed it at six weeks. I should have taken it out of the 10 C cave after it ripened for 3 weeks, and put it into the cold fridge to stop the ripening process. But funnily enough, I did the same thing last year and it was just fine! 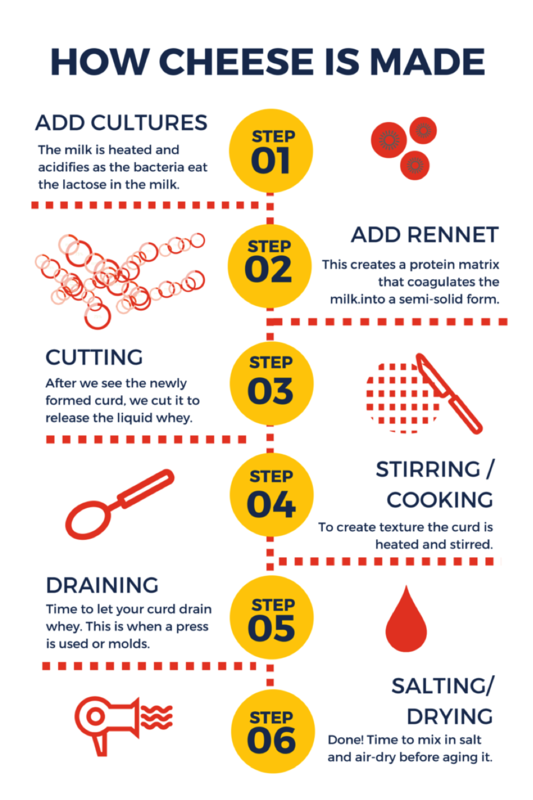 Cheese making is a real learning process! It was still good, but really too strong for both me and Alex. Since this past summer, I've enjoyed making videos on my main blog (Rain's Garden) so much, that I thought it might be fun to make a video tutorial of how I make my cheeses. 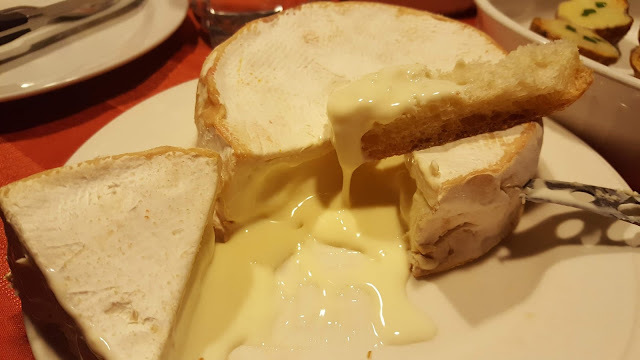 Today I'm going to link a video on how to make Camembert. The whole process took me the entire day but I condensed the video down to under 30 minutes. 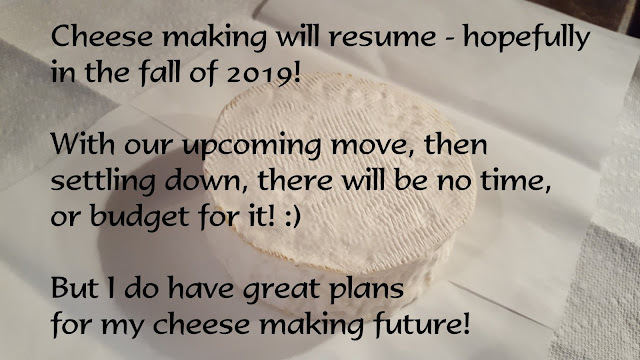 I encourage EVERYONE out there to do some cheese making! 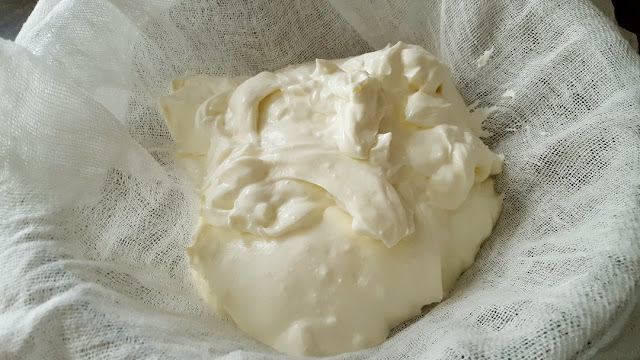 If you don't want to start big, start with making yogurt, or ricotta, or even sour cream! 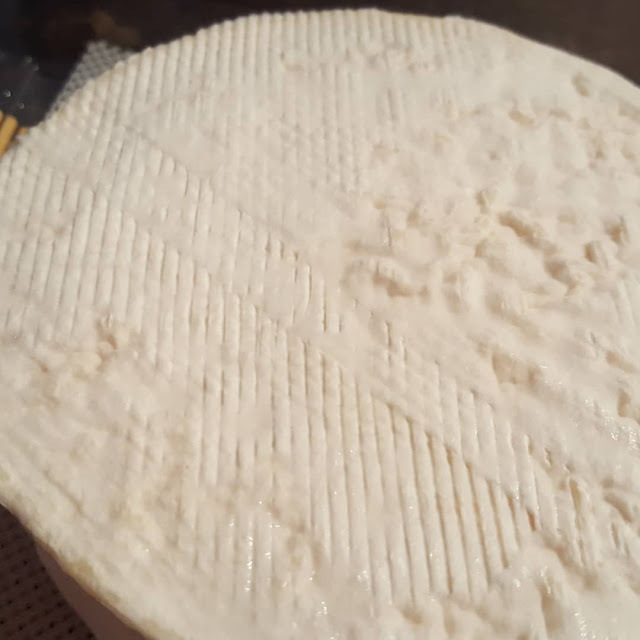 I'll be making videos of all of my cheese making from now on to share. I'm also going to re-vamp this blog a little bit over the next few months to better organize it! I'm happy to say that I have finally perfected my homemade sour cream and I wanted to share the recipe. I find the BIG difference here is the ingredients. 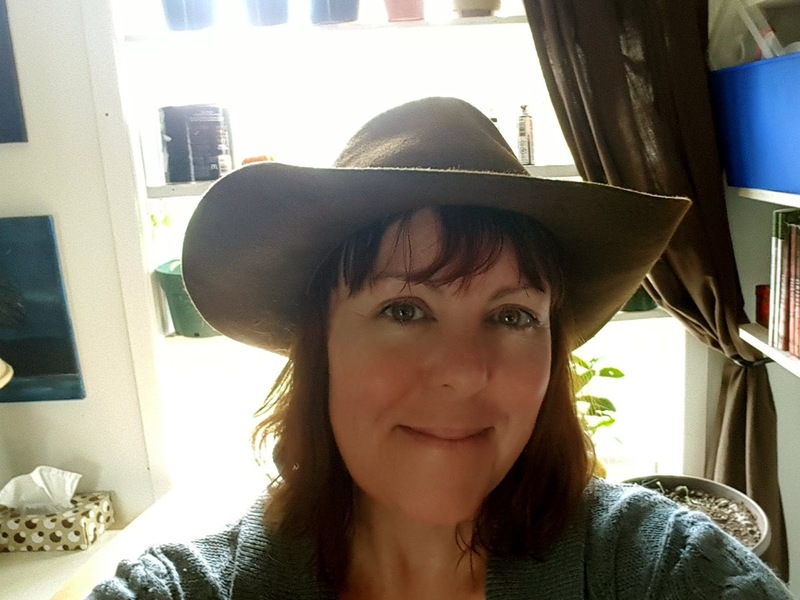 I was buying my ingredients from a company in Alberta; but their products were sub-par I've learned the hard way. 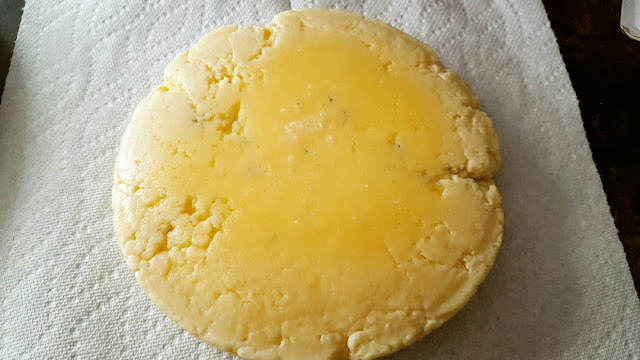 Every single cheese I made last year with their products failed either in texture or taste. Their customer service was nothing to write home about either, they don't even have a phone number. I let the owner know about the failures but never heard a peep. It was so disappointing that I nearly gave up completely thinking it was just me, that I just wasn't cut out for cheese making. Here's the recipe...it's SO EASY. It costs about $3.25 CAD (in my area) to make 2 cups. 1. Heat the milk, cream and Calcium Chloride slowly in a pot to 86F, mixing gently to make sure it doesn't burn or stick to the pot. 2. Add the culture and let it sit for 3 minutes, then stir well, but slowly. 3. Add the rennet and stir well, but slowly for no more than a minute. 4. Cover the pot and let it sit overnight at room temperature (12-15 hours). 5. The next day, check your sour cream. 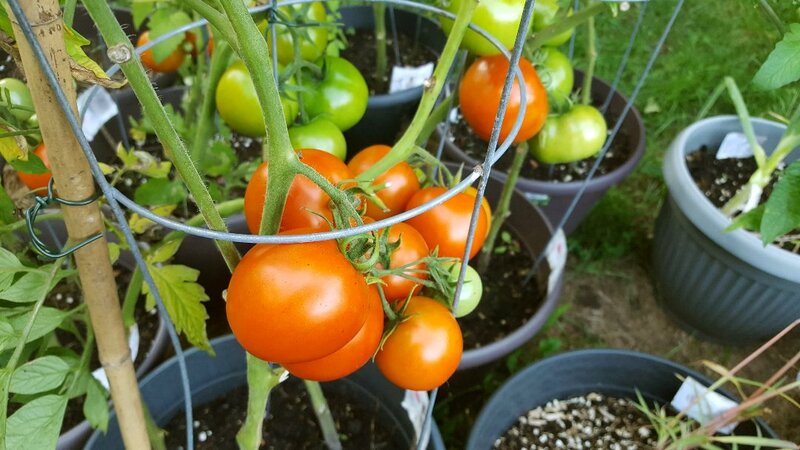 If you see it pulling away from the sides of the pot, it's ready to be drained; if not leave it longer. I usually leave mine about 15 hours or so. 6. Line a colander with cheese cloth and ladle the sour cream into the colander. Let it sit for an hour, keeping the whey for other uses. Remember to barricade your set up from the cats!! They love the smell of this! 7. After an hour, tie the ends of the cheese cloth together and hang it up, letting the rest of the whey drip out. This needs to hang and drain another 8 hours. I hang mine from the kitchen cabinet and let it drip in a pot on the counter. Keeps about a week or so. 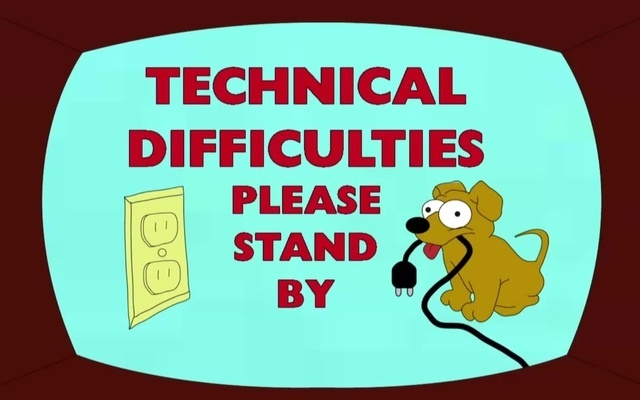 Trouble Shooting: If it doesn't set, you didn't use enough rennet or your rennet is bad. If it's too sour, you used too much rennet and/or your culture is bad. 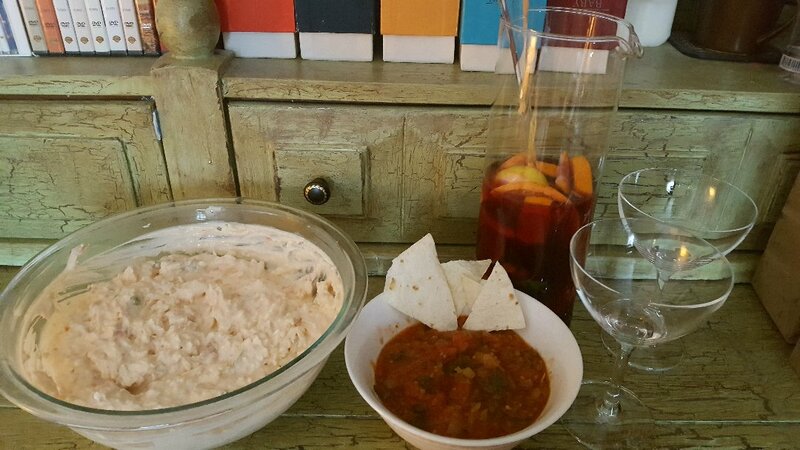 Some suggestions for sour cream, I use it A LOT!! 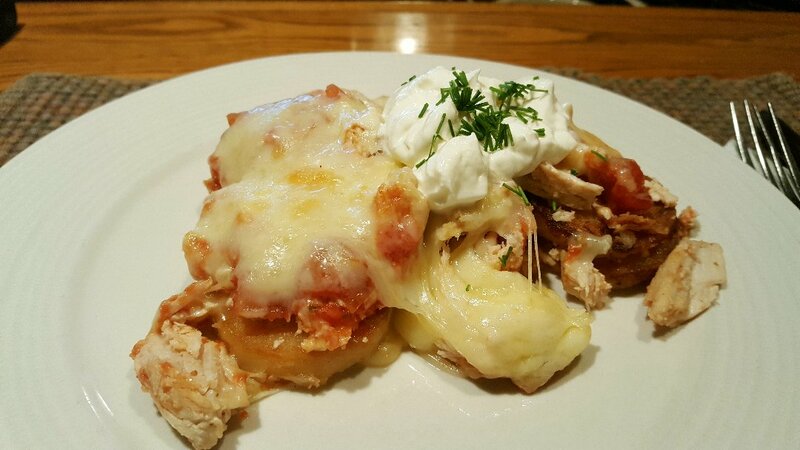 Click on the links for the recipes! 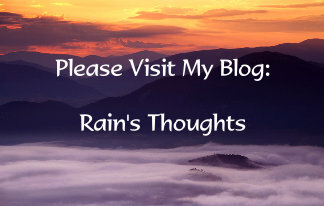 THIS IS A POST I DID ON MY MAIN BLOG: Rain's Garden with regards to a new policy on Blog Comments! 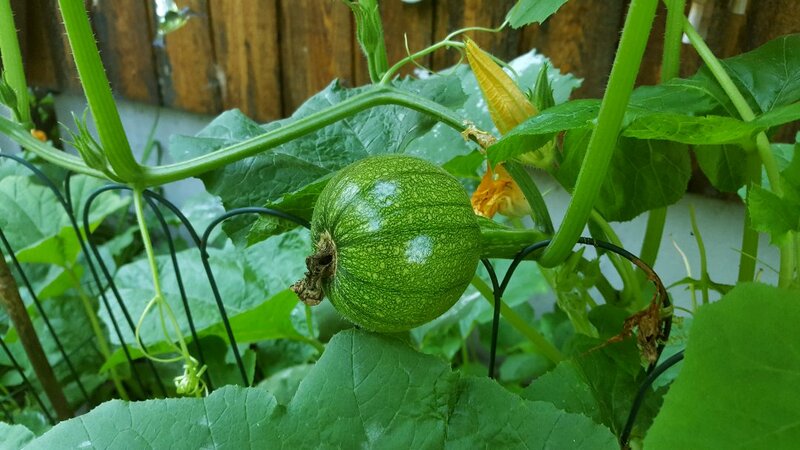 And my very first sugar pumpkin...do you think it'll have enough time to ripen? And all throughout the last few days I keep getting hundreds more on various posts on my blogs. This doesn't worry me at all, I know they are just randomly generated, but it's just annoying, so I'm going back to only allowing comments from people with Google accounts. I know that some of my followers don't have accounts with Google, but I hope you understand. I just don't have the time to moderate comments when I'm getting so many spam ones. If you don't want to open a Gmail account, I totally get that, but if you want to contact me, you can always use the Contact Form on my sidebar! I'm also on Instagram. 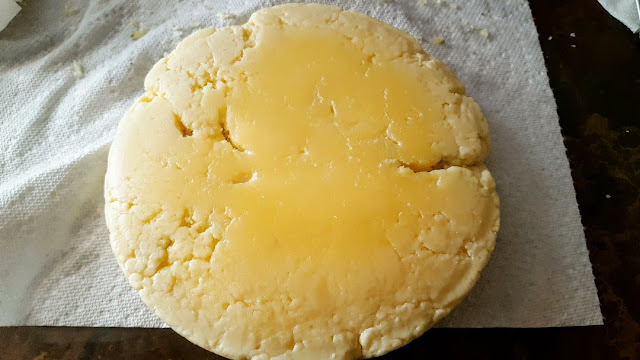 I haven't written much on this blog in a while...the Cheddar fails nearly broke my cheese making spirit...and I didn't even mention my Dry Jack cheese fail (we opened it May 1st and it was sour! )...I nearly gave up on the cheese making. In fact, I wasn't going to renew this domain name but Alex encouraged me. I'm so glad he did. 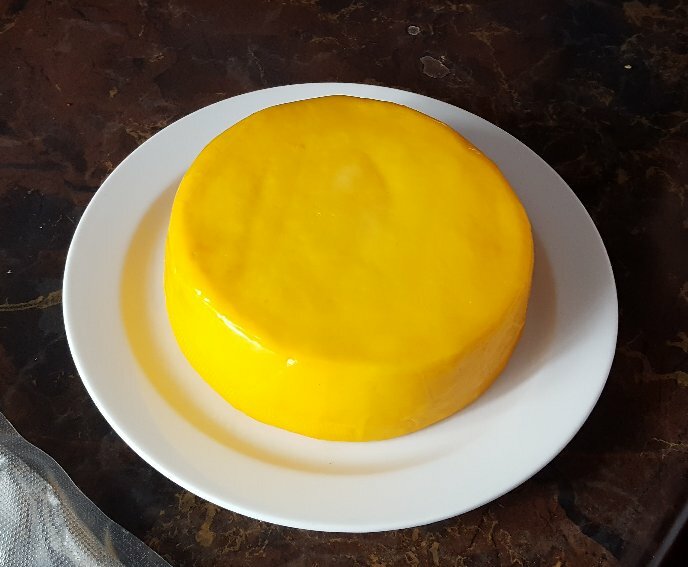 The Alpine cheese I made last October was a success!!! 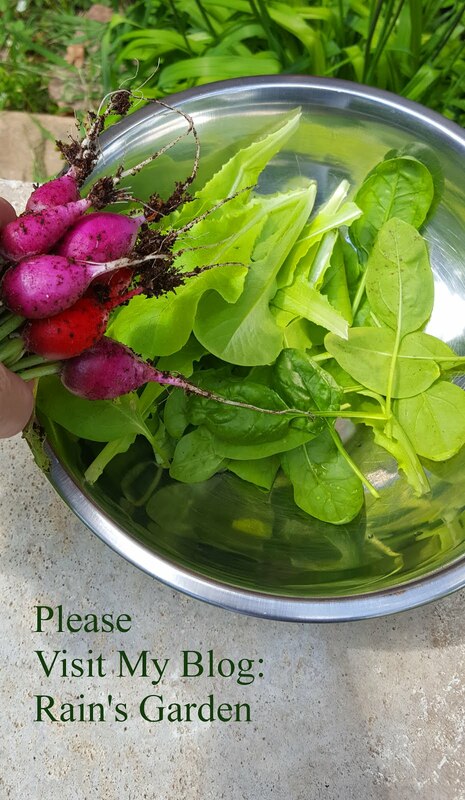 :) (I will find time shortly to post the recipe!) Aging it for 7 months made it really flavourful. This is a "Baby Swiss" cheese. I had so many issues with it because I couldn't seal it properly due to its size. 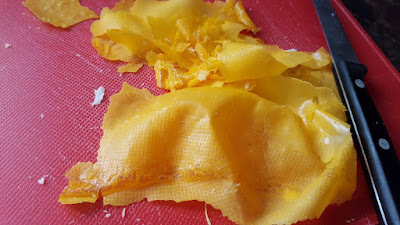 I had to cut it and seal it and that created too many pockets for mold so half the cheese was wasted, but what was left (above) tasted like a mix between Parmesan and Jarslberg!! 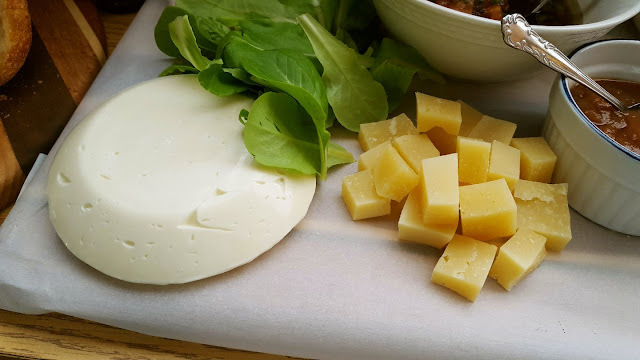 ...with my homemade No Knead Bread, I made a Quick Mozzarella, picked some homegrown Buttercrunch lettuce and Alex cubed up the Alpine cheese. I made a "cream cheese" the other day. 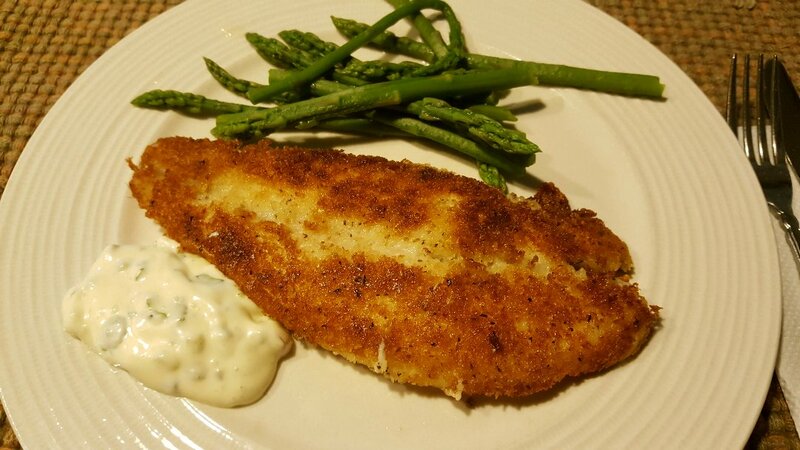 This recipe is so easy, anyone can make it. BUT...as I mentioned in 2017, it does NOT taste like any cream cheese that my palate is used to! I.e. Philadelphia-style cream cheese. I can't recreate that cream cheese because it has questionable additives to make it sweet. But I did try to recreate it last year, without success...I won't be giving up though. So in the mean time, this "cream cheese" recipe will now be called a sour cream recipe! 1. Heat the milk, cream and Calcium Chloride slowly in a large pot to 86F, mixing to make sure it doesn't burn or stick to the pot. 2. Take off the heat, add the culture and let it sit covered for 3 minutes, then stir well for one minute, but slowly. 3. Add the rennet and stir well, but slowly for no more than a minute (more than that and it stops working it's magic to make your curd). 4. Cover the pot and let it sit overnight at room temperature (12-15 hours). I checked mine at 10pm after 10 hours and it wasn't done, so I let it sit overnight, a total of about 20 hours and it was fine. 5. Check your sour cream. If you see it pulling away from the sides of the pot, it's ready to be drained. If it doesn't look like it's pulling away, gently dip your finger into the curd, if it feels like a good semi-soft tofu, it's ready. 6. Line a colander with cheese cloth and ladle the sour cream into the colander. 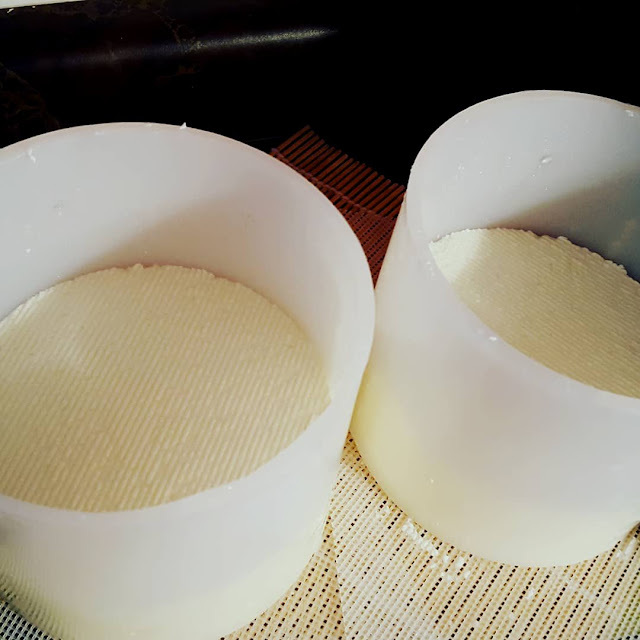 Let it sit covered for an hour, keeping the whey for other uses or for your plants (they love it!). 7. After an hour, make a hanging set up, like the photo above. This needs to hang and drain another 8 hours. 8. 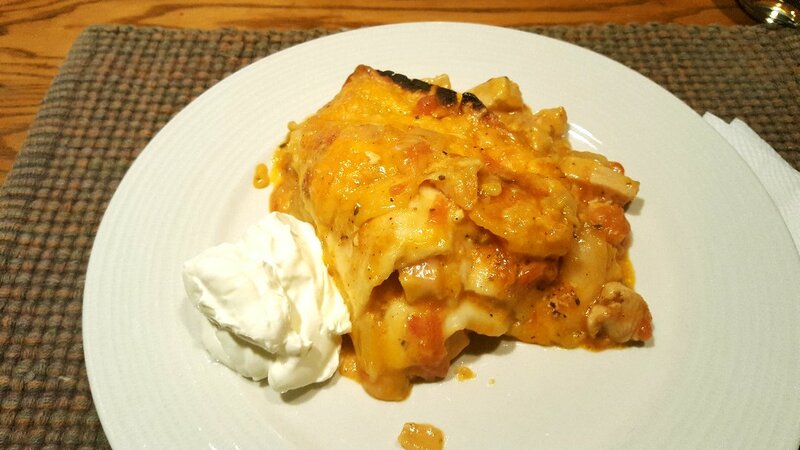 After 8 hours, transfer the sour cream into a container and refrigerate, this will harden it up some. It will be good for about a week to ten days. 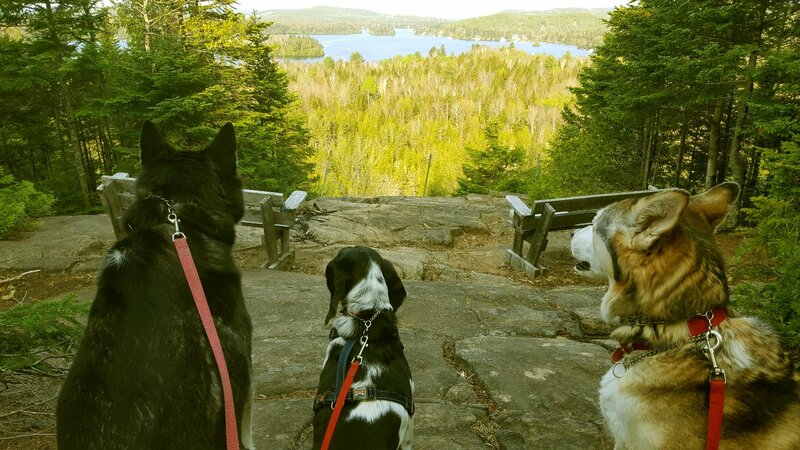 Two of the Three Cheddars Were a Success! 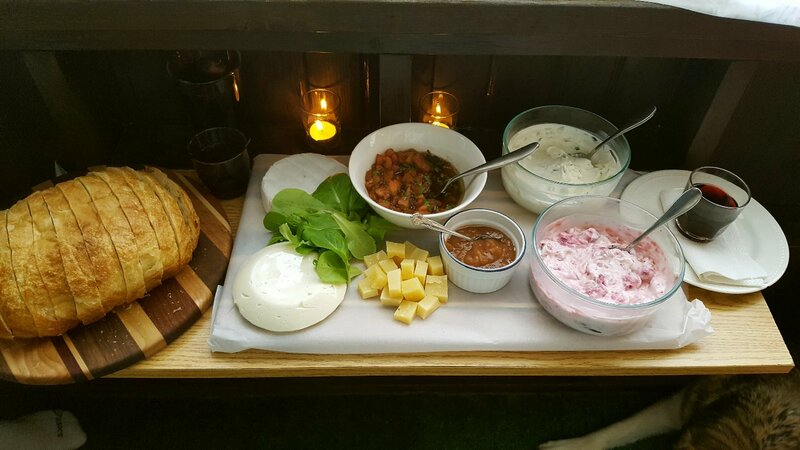 Instead of repeating my entire post here, I'll be lazy and give you a link to my other blog where I posted about Cheese Night! 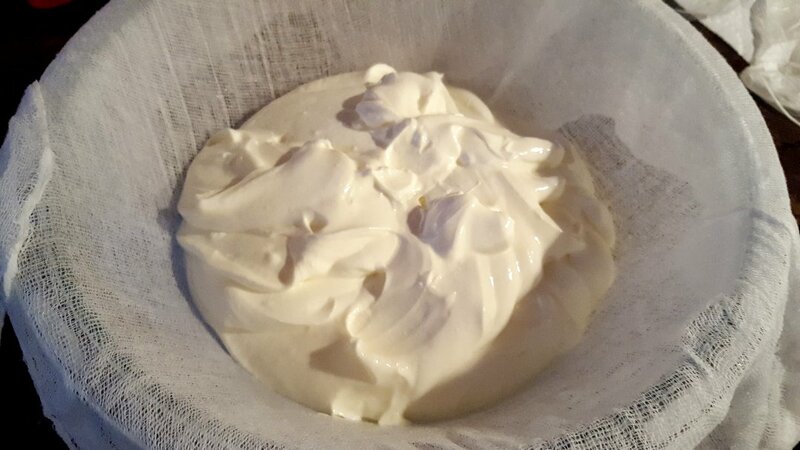 When I first made my batch of cream cheese, I was very surprised at the results. 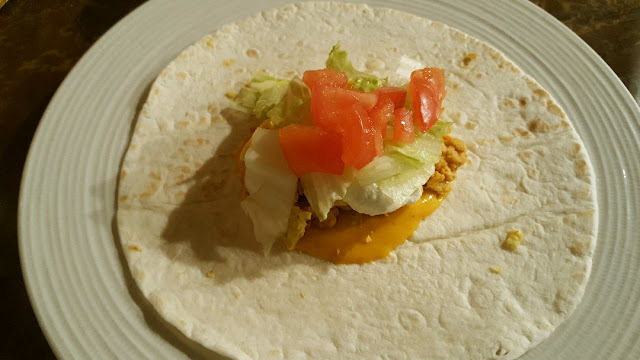 It was very tangy and tasted more like a really good sour cream than anything else. I guess being brought up in a city where food comes from the grocery store had me thinking that cream cheese should taste like the Philadelphia brand cream cheese, which is sweet when you compare the two. Carob Bean Gum, also known as Locust Bean Gum, is a gelling agent derived from the Carob tree. It's also sweet, so it acts as a sweetener in the cheese. But that word "derived" bothers me...how exactly is it derived and what is the final product? Sorbic Acid is a food preservative, thus the long expiry dates on the products. Homemade cream cheese is good for about a week or so only. I'm not trying to burst anyone's bubble, both Carob Bean Gum and Sorbic Acid aren't known to be toxic to the system. I just want to try to go the natural route as much as possible. Still though, that Philadelphia cream cheese is good stuff and I'll buy it until I can perfect my own! Firstly, I decided to try to make the cream cheese again, since the first batch was used as a sour cream with our Mexican dishes. As an experiment, I did two batches, the recipe is exactly the same except I used two different bacterial cultures. The buttermilk culture batch came out much creamier and less tangy than the mesophilic culture batch. 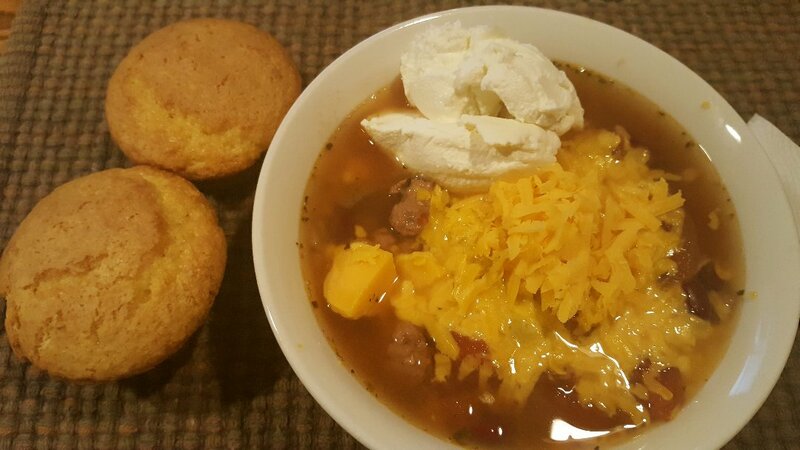 Both still tasted more like sour cream, sigh. I still wanted to make some Philadelphia cream cheese though! So with all of that in mind, I did a search on the internet to see what others do to make their cream cheese a little more like the Kraft brand and came up with a few ideas. This is what I did. 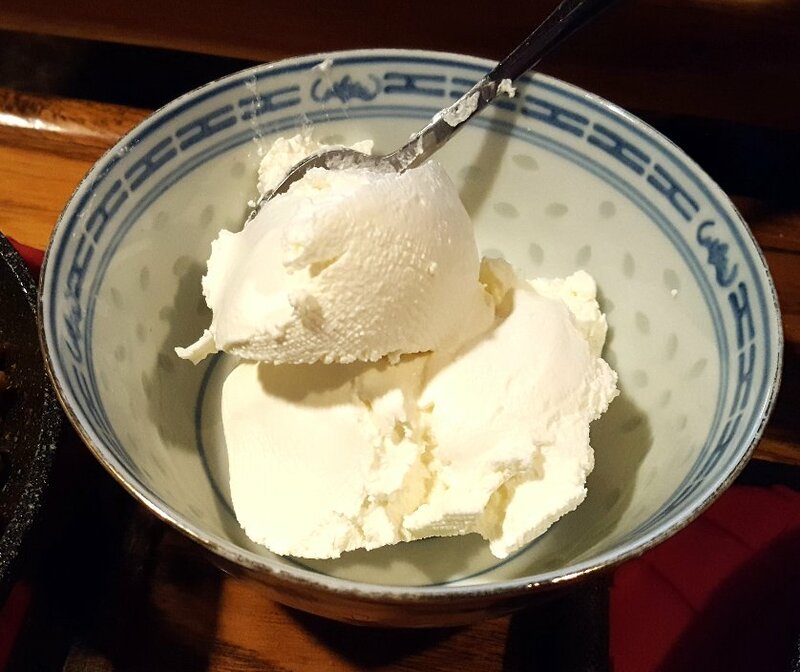 I took one batch of my cream cheese, added a cup of vanilla yogurt and 2 tsp of salt. Then I drained it for an hour, wrapped it up and put it in the fridge overnight. It was sweeter, but nothing like Philadelphia brand. 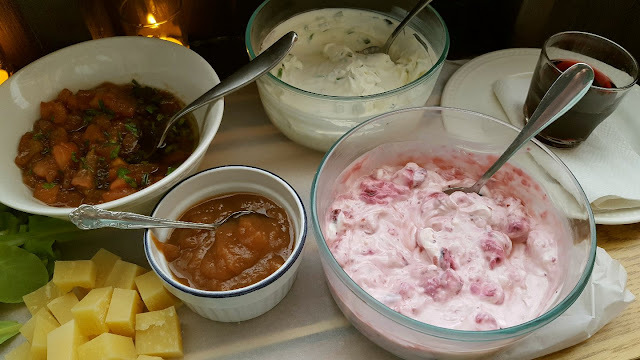 I still have to work on this to figure out how to perfect it...but it did make some really good flavoured cream cheeses! 5. The next day, check your cheese. If you see it pulling away from the sides of the pot, it's ready to be drained. 6. Line a colander with cheese cloth and ladle the cream cheese into the colander. Let it sit for an hour, keeping the whey for other uses or for your plants (they love it!). This orange coating is HORRENDOUS. I really cannot believe that anyone actually likes this crap. 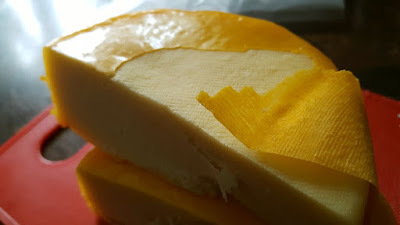 When we opened our first Cheddar before Halloween, it smelled like nail polish remover. 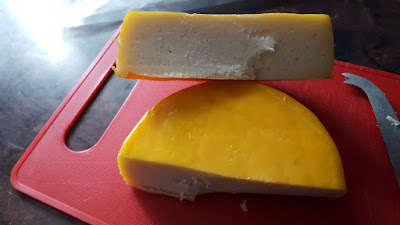 We removed the horrible orange coating, cut a third of the cheese off (the thick rind) and let it "air out" for SIX days...it still smelled and tasted like the coating. 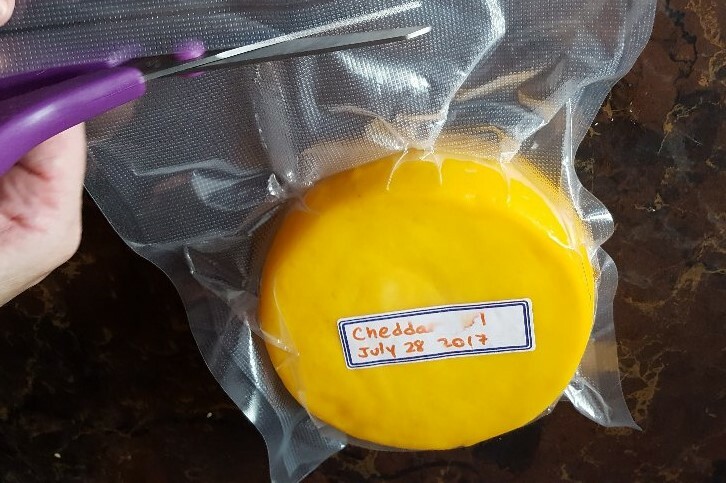 My very first Cheddar that I made on July 28th is now in the trash. I had to make the sad decision to throw away this beauty too. 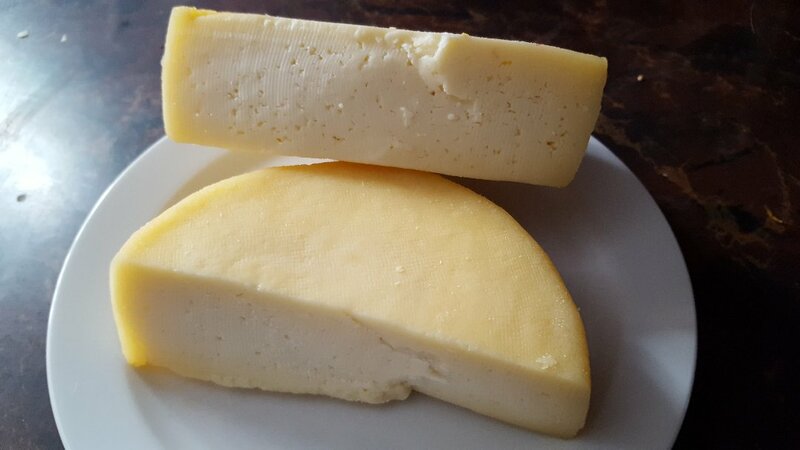 This was the second wheel of Cheddar that I made in August. It was supposed to age for 6 months and be ready for Valentine's Day. I already know what it's going to smell and taste like, so why prolong the agony right? Sigh. 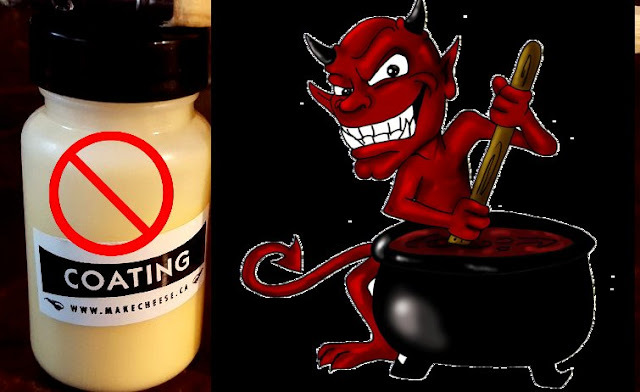 DON'T EVER USE THIS COATING PEOPLE!!! Don't let the cheese making supply shops convince you otherwise unless you like plastic-chemical tasting cheese. I nearly cried when I threw this out. 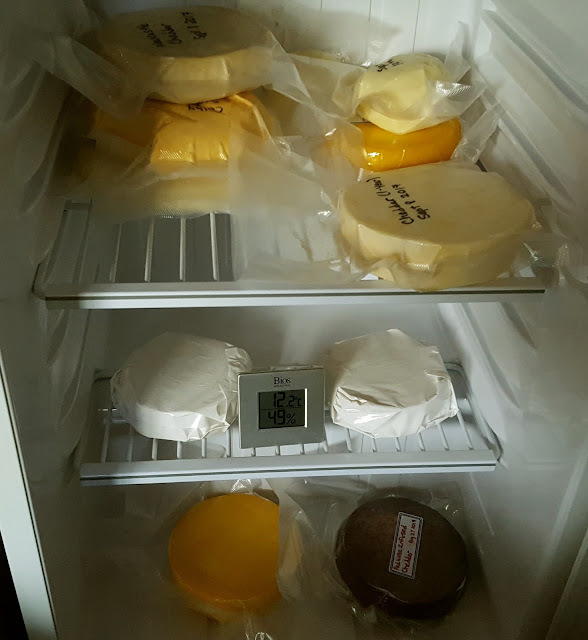 My Baby Swiss has been drying in the cheese cave, uncovered, for the last month. Every day I flip it and brush off any mould that has formed. 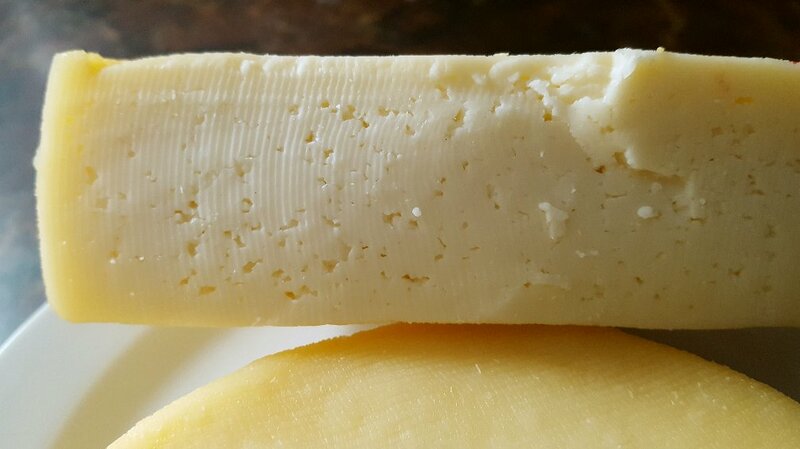 You can see some tiny little dots of mould on the cheese. Here is another lesson I learned. It will be challenging to make a pressed cheese without the proper mold and cheese press. It took me about half an hour this morning to poke out all the mould from my cheese, and I'm sure I didn't get it all. I'm about to diss a well-loved company so be prepared. 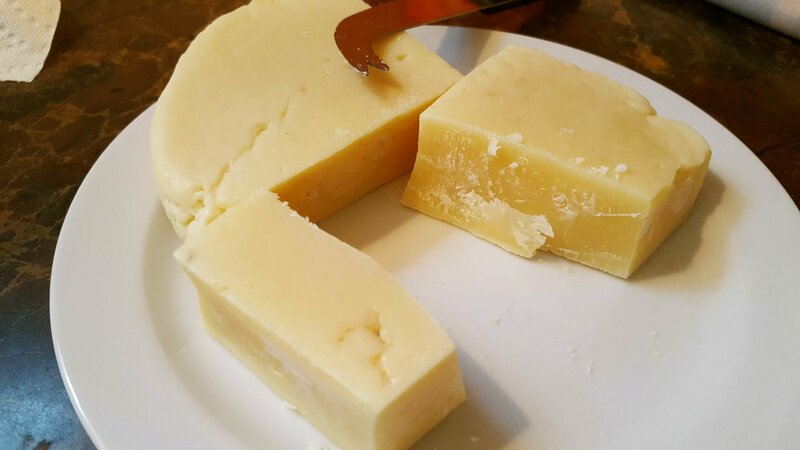 The New England Cheese Making company offers so many free recipes on their site; with a list of ingredients to buy. I'm not the first person to claim that their recipes are badly written on the site. I'm also not the first to report that cheeses made from their recipes taste nasty (my Colby). Just check out the cheeseforum.org and it's full of disappointed cheese makers who have used those recipes. And people who are frustrated by the lack of help and response when you email them. The company claims that you don't need fancy molds and expensive cheese presses to get great results. Hmmm...not true at all. I didn't have the right mold for the Baby Swiss and it's really too thin. I didn't have an expensive cheese press, I had to use weights and cans and it's full of cracks and holes - ripe areas for mould to just dig in - something I found out this morning. I know that the inside of these cracks are full of mould, but I can't pick apart the entire wheel of cheese, I just have to hope for the best. We shall see. Ideally this should be a smooth texture with the holes on the INSIDE. What can you do? I guess I was mislead. But I'm still learning all about cheese making and I can only go up from here. The coating came right off but I have to say it stunk like something unnatural...nail polish remover maybe?? Anyway, we were a bit worried about the flavour. I had read that I should let it "air out" for a few days before eating it so that any lingering taste of plastic will dissipate. We couldn't help ourselves though! We tried it and yup, it tasted like that plastic coating. But...the cheese is DARN GOOD!!! 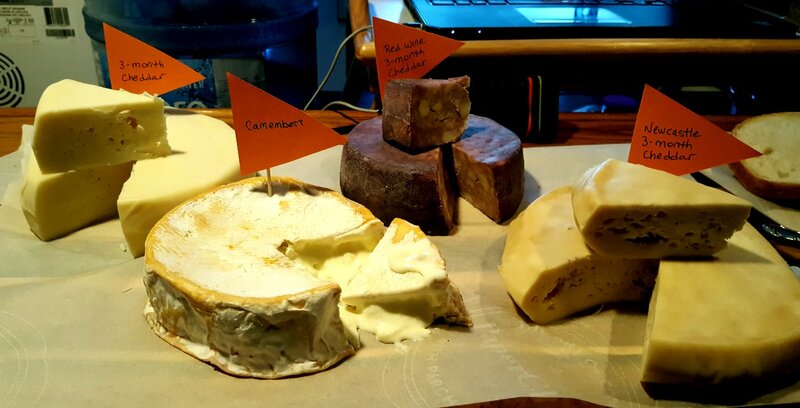 Once that initial taste is gone, the flavour of the cheese comes out. It was nice and mild but slightly tangy! There are some small holes, but that's due to the fact that I don't have a proper cheese press, but that's just fine. :) I would say that if I hadn't used the orange coating, this would have been a total success. We decided to cut the rind off and let it sit for a few days in hopes that it won't taste too plasticky anymore. But...if it does, this will be my first lesson to never use that stuff again. In fact, I've already decided not to. My second Cheddar which is aging 6 months is also coated so I'm going to take the coating off and let it also sit for a few days, then continue to age it. The Cheddar on the bottom shelf is the 6-month coated one that I have to fix up. The red wine-infused Cheddar will be ready any time we want to try it. We also have a Newcastle-infused Cheddar for Christmas and a Cheddar aging for a year up there on the top shelf. I'm pretty confident that they'll taste great. 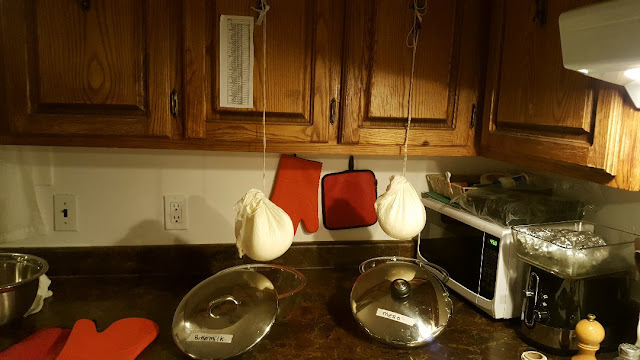 Ideally I would love to not even have to seal them, but I don't have a real cheese cave yet so they need that protection!